I’ve only been using Reeder (after Ben who I work with at Roxxor recommended it to me, thanks Ben) for a few days but already it has changed the way that I interact with the web. I’ve had a Google Reader account as my RSS feed reader of choice for several years now and for a long time I would log on and check it religiously every day. I’d spend at least an hour a day scrolling through the 1,000+ new blog posts, articles and links that the various feeds that I subscribe to had posted. I felt like it helped me keep my finger on the pulse of the latest and greatest happenings from around the web. It was a massive step up from the days of having to go to every site I liked one at a time to see if anything new had been written since my last visit. Then Twitter came along (or rather I started using it…) and I found that a lot of what I was reading via RSS was being tweeted about and that it was a lot more interesting and felt more instant to use twitter to inform me what was going on. Tools like TweetDeck meant that not only could I follow and organise what was going on in the twitter world, but I could do so from my iPhone as well as my laptop and the tweets came to me without me having to log in and refresh a webpage, allowing me to feel connected and informed all day every day from anywhere. Over time checking my Google Reader account for news started to feel both redundant and like a chore, especially when thanks to the UI I was having to scroll through every single article in order to see the headlines of each. Reeder changes that. Now I have a RSS feed reader on my iPhone, and on my desktop that tells me when there’s something new to read. It lets me feel connected again, and it does so beautifully. I’m checking my RSS feeds daily again, in fact several times a day. If I’ve already seen something via twitter it doesn’t take much to scroll past and ignore it and, more importantly, Reeder lets me scroll through just the headlines of articles, letting me scroll past and ignore anything that I’m not interested in. This alone makes Reeder 100 times better than Google Reader, but that’s not the only advantage Reeder has over Google. 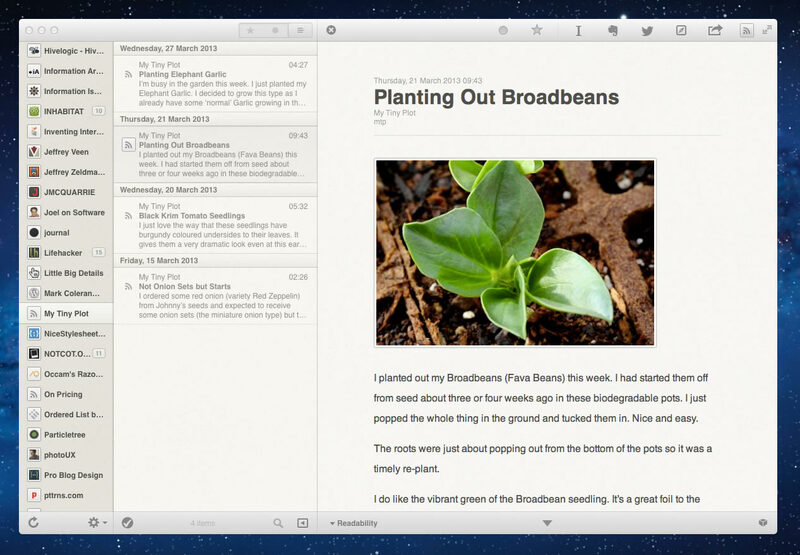 Figure 1 The beautiful Reeder for Mac User Interface. The understated Reeder UI is a work of art. For a long time I have argued that an Interface Designer’s job is to make the app / site disappear and to make the content stand out and easy to interact with. The folks behind Reeder have done just that. It’s the content that is the focus with settings, options, actions and even the application’s chrome taking a back seat until you go looking for it both in the desktop and the iPhone versions. The interaction design is also streets ahead of the default Google Reader, letting me skim through content or dive deep into every article in a very simple and efficient way. Minimal chrome. Simple, limited actions. Beautifully subtle colour scheme and design. Love it. When I finally give in to temptation and get an iPad (I’m holding out for iPad 2) I’ll be buying the iPad version too and love that all three will permanently be keeping me up to date with the goings on in the World in perfect, sync-ed harmony.